Workshopping app and games ideas with over 300 teenagers, at TeenTech Staffordshire. Last week kicked off the TeenTech events for the new school year. A year ago we got involved with TeenTech, an award winning, industry-led initiative, founded in 2008 by Maggie Philbin and Chris Dodson to help teenagers understand their true potential and the opportunities available to them in the science and technology industries. 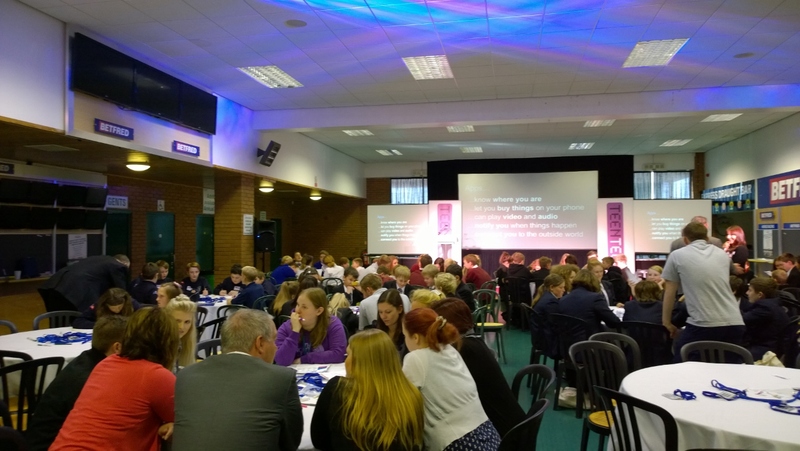 Last week, myself and Liz Rice from TankTop TV travelled up to Uttoxeter Racecourse to run the Innovation Zone at the TeenTech Staffordshire event. At each event, we give a presentation about app development and coding, and then workshop ideas with around 300 teenagers at each event, developing their ideas in small groups. The Staffordshire event was a great success, with some really innovative game ideas being presented, many of which I wish I had thought up! The next day, myself and Liz were presenting at TeenTech in Tonbridge, Kent. This event was extra special for us as Tonbridge was where we presented at our first ever TeenTech event a year ago. The event was great fun, and it was lovely seeing the staff again. There was a real lean towards innovative educational app ideas at the event, with some interesting social apps and apps involving wearables – a growing trend in our industry. We hope that the pupils at both events take their ideas forwards through the TeenTech Awards.